posted on Apr. 02, 2019, at 9:00 a.m.
It’s said that everything’s bigger in Texas, and the fourth “Battle of the Chefs” cookoff was no exception. More than 250 designers, builders, architects and foodies descended on Dallas for the culinary competition, presented by Luxe Interiors + Design Magazine and NKBA as title sponsor. The stunning contemporary building features two striking sculptures: the Fire Chandelier, and the Ice freestanding sculpture. They are replicas of installations by artist Dale Chihuly at the Madison headquarters. Fire represents the cooking side of the business (Wolf) and Ice represents the refrigeration component (Sub-Zero). The upper level boasts an array of product displayed in vignettes, with an open atrium overlooking three test kitchen zones, which allowed for three teams of seven. Each team was led by a renowned local restaurant chef. The sold-out event drew guests from all around the region, and closed-circuit TV ensured that everyone had a great view of the 55-minute competition. 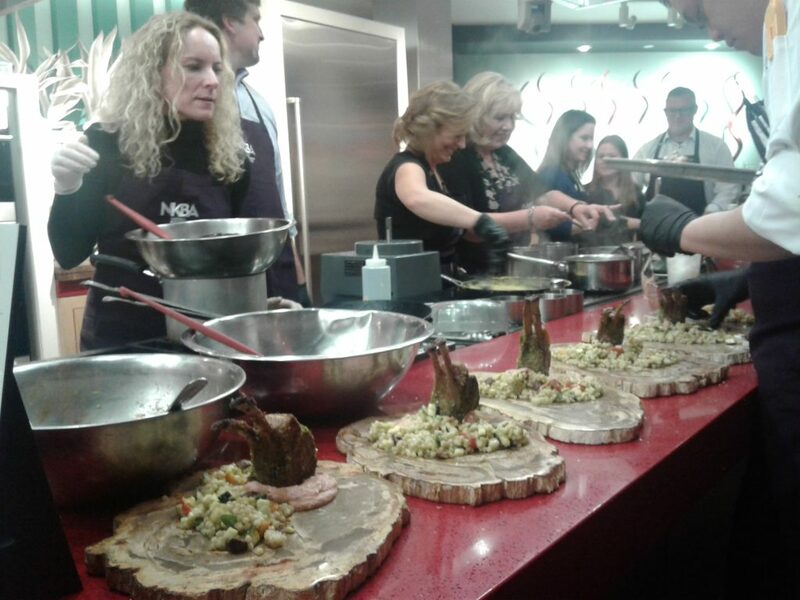 Teams had to prepare a first course and an appetizer, and as with all Battles, the chefs were informed of secret ingredients to incorporate just prior to the start of cooking. On this night, the mystery additions were Graham crackers and avocado. Team 1, led by Chef Samir Dhurander of Nick & Sam’s (third from left). Team 1 was led by Chef Samir Dhurander of Nick & Sam’s, and included Carolina Gentry, Pulp Designs and an NKBA Insider; Shannon Green, Arveaux Interiors, Guy Cavazos, Cavazos Construction; Dan Typaldos and Nolan Harbert, Bernbaum Magadini Architects, and Sam Allgood, Milan Design + Build. Team 2 was headed by Chef José Meza of Jalisco Norte, and his assistant chefs were Jenifer Wiley, J Wiley Designs and president of NKBA’s Texas North Plains chapter; Scott Faulkner, Falkner Perrin Custom Hones; Helene Terry, Helene’s Luxury Kitchens; Holly Hickey Moore, Holly Hickey Moore Interior Design, and Paige Sowden, Interior Resources. Chef JP Dacio of The Capital Grille led Team 3, assisted by Kelli L. Parker, Elite Remodeling; Tina Jeppesen, Dallas Luxury Beds; Greg Haczynski, Expressions Home Gallery, Daniel Scott, Jim Scott + Sons; Tiffany McKinzie, Tiffany McKinzie Interior Design, and Verona Prive, Verona Prive Maison. As the bustling teams chopped, sautéed, seared, sliced, grilled and fried on state-of the art equipment, guests enjoyed wine, a Melagro Tequila tasting and an assortment of hors d’oeuvres, topped off by mini-boxes of Kate Weiser chocolates. The teams sent out artfully plated dishes including beef tenderloin with a crab cake and avocado puree and macaron ice cream sandwiches, lamb shank with farro and avocado and baked Alaska, and homemade tacos with red snapper ceviche, avocado and black-bean puree and chewy toasted coconut cluster with passion-fruit puree. Team 2 plates its lamb and couscous (foreground) while Team 3 cooks and seasons. Judges included Paulette Pearson, editor of Luxe’s Texas Homes magazine; Pam Ryerson, NKBA’s Director of Marketplace; P. Santiago, Santiago Iron Works; Faye Nielsen, The Nielsen Collection, and Whitney Plonka, The Richards Group. It was a tough but delicious decision, and in the end, Team 1 came away with the victory for its tenderloin, crab cake and macaron ice cream sandwiches. 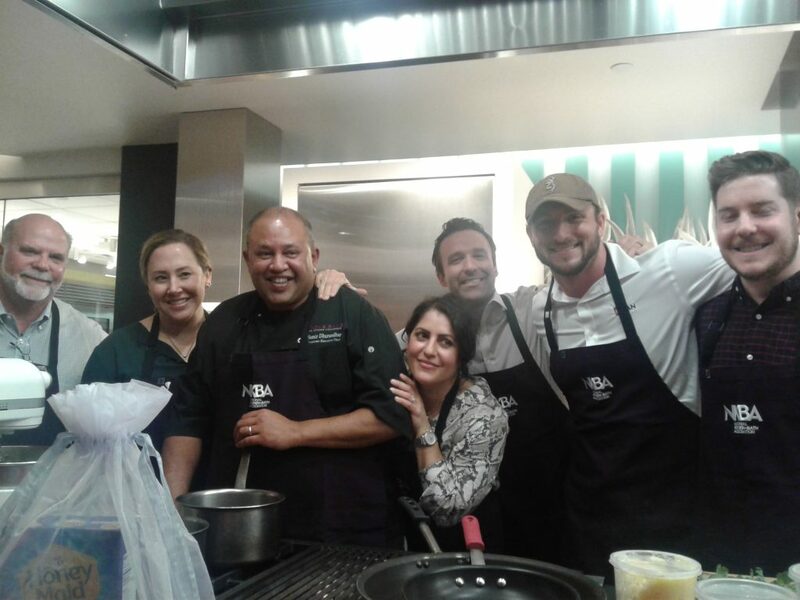 Luxe and NKBA partnered on three Battle of the Chefs competitions in 2018, at Riggs Showroom & Distributing, a Sub-Zero Wolf showcase in the San Francisco suburb of Burlingame, Calif., followed by a contest in Norwalk, Conn., at the Aitoro Appliance showroom, and in Chicago at the Miele showroom in the Merchandise Mart. The series is expected to continue in 2019, although dates and cities have not yet been firmed up.